London’s cinema club the Scala started life in a building backed onto Scala Street near Goodge Street tube, with a tiny screening room and a cafe with plastic tablecloths. It was founded by my old pal Steve Woolley, who modelled it on the Nu-Art Cinema in Los Angeles, showing everything from Russ Meyer to Jacques Tati. Steve went on to set up the legendary Palace Pictures and produce countless films. Two years later it moved into the old Kings Cross Cinema, which had been nearing completion when the First World War began. Instead it was used to manufacture airplane parts, and after 1918 as a local labour exchange for demobilized soldiers returning from the war. It finally opened as a cinema in 1920. Seating over 1000 people, the auditorium offered a three-hour program, accompanied by a 20-piece orchestra. At the end of the twenties, under the control of Gaumont British Pictures, the cinema staged lavish free Christmas shows for local children – endearing it to a whole generation. It was damaged in air-raids during the Blitz but reopened in 1952. The venue finally became a live, all-night, rock venue. Iggy Pop and Hawkwind played there, but in 1974 it all came to an end when its license was revoked. Five years later it became – ludicrously – the London Primatarium, with a stage like a forest and live primates roaming about (this was an era when there was also an equally sad and awful Dolphinarium in Oxford Street!). The project mercifully failed and it returned as the Scala, featuring the 1933 version of King Kong on opening night in an auditorium that still reeked of live monkeys – that night I went home smelling of gorilla. Warner Brothers were tipped off about an illegal screening of Stanley Kubrick’s A Clockwork Orange and sued (the film having been withdrawn by the director over so-called copycat violence). The Scala lost its battle against Warner Bros and plans to convert it into a multiplex failed. The increasing availability of transgressive films on video was meant that the cinema was no longer so special. It was finally reborn as a nightclub, which it still is, and has been fully refurbished and repainted, although I’ll sadly never see the inside now unless I want to catch Japanese DJs and bands with student fanbases (see below) that will render me the oldest person in the room. I remember the midnight Friday audiences – a barmy army – which gathered on a regular basis at the Scala to watch “Thundercrack!” and the mayhem and al fresco blowjobs which were all part of the experience. I was there one afternoon to watch a much-loved film “The Case of the Smiling Stiffs ” and when the lights went up – insofar as the stygian light allowed – seeing a senior member of a prestigious antiquarian London booksellers sitting with a a person of dubious mien who seemed quite startled and embarrassed to see me there! Ah memories of our own type of 42nd Street debaucheries and weirdness! 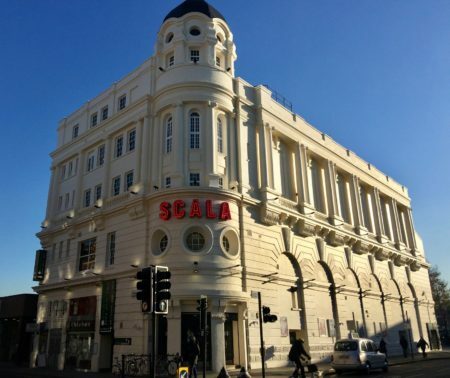 The Scala was always exciting…whatever time of day or night…. Isn’t there massive snooker place either part of that building or close by? I saw everything there, from “Carry on Camping” to “Querrelle of Brest”*. I’m sure there’s a double entendre in there somewhere. I think the snooker place is still there, Jan, although it wasn’t the only spot where they were sinking the pink! Have they got rid of the fleas yet? After my first visit I made sure my trousers were firmly held by my bicycle clips.